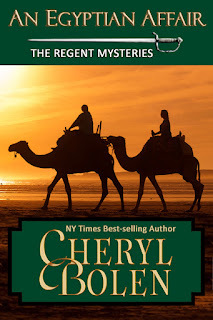 While Captain Jack Dryden would lay down his life for the Regent, he draws the line at endangering his wife in the dark alleyways of Cairo—the place where the Regent's friend and procurer of antiquities has gone missing. But Lady Daphne Dryden will not be denied the opportunity to see swaying palms, crumbling pillars, and soaring pyramids in exotic Egypt. She even insists on bringing her youngest sister, Rosemary, who's enamored of all things Oriental. The Regent insists on sending Stanton Maxwell, England's most imminent expert on Egyptology, as their interpreter and his own soldiers as their protectors. Once in Cairo, Jack and Daphne begin their inquiries, inquiries which almost certainly cause the murder of one woman and the abduction of Lady Rosemary. Will Jack's wits—and the unexpected bravery of Mr. Maxwell—be enough to extricate them from danger and unmask the evil-doers? Jack bolted from their tent. "What's happened?" "Rosemary's gone!" Daphne stood just inside her sister's tent, her hand still lifting the entry flap. "Someone's taken her!" Shirtless and barefoot, Maxwell came rushing from his tent on the other side. "This cannot be! I never heard a word . . . I swore I would protect her," he said, his voice forlorn. The rear of Rosemary's tent had been slashed through. Jack whirled around to chastise the soldier he'd asked to guard Rosemary. The fellow was sitting in the sand directly in front of Rosemary's tent, his head bent, chin on chest, eyes closed, hugging his musket to him as if it were a cherished woman. He was sound asleep. Jack mumbled an oath as he began to shake the soldier. He did not readily awaken. Then Jack smelled it. Laudanum. "The guard's been drugged with laudanum!" "We need to determine if anyone else is missing," Maxwell said, his voice commanding. Jack's eyes narrowed. "It wouldn't surprise me to discover that one of our recently hired servants is responsible for Rosemary's abduction." His gaze returned to Rosemary's tent. "Daf, can you see if anything of your sister's is missing?" By now Arbuthnot had made his way to join the others. He was fully dressed except for his coat. "Are you saying Lady Rosemary is missing? Are you sure she's not just gone exploring? Didn't she express a strong interest last night in seeing the mestabas?" Jack faced Arbuthnot and spoke in a growl. "Some vile person slashed through the back of her tent and apparently carried her off." Arbuthnot's eyes narrowed, and he uttered a curse. Maxwell looked forlorn. "And I promised her I would protect her." Jack placed a hand on his shoulder. "Don't blame yourself. I was just as close to her tent as you were, and I slept right through her abduction." "Dear God, I hope she's not intended for white slavery," Arbuthnot said. Daphne poked her head out of the tent and harrumphed. "They'd be sure to bring her back. My sister is not only incompetent about cleaning floors and polishing furniture, but she's never in her life lifted a hand in pursuit of tidiness." Jack coughed, and despite the gravity of the situation, his eyes twinkled with mirth. "It appears my wife is under a misapprehension about the nature of white slavery." 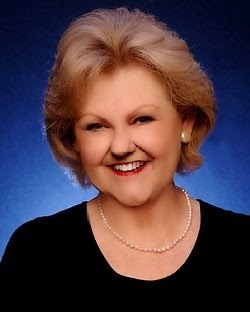 Cheryl Bolen is the New York Times and USA Today bestselling author of over 20 romances, both historical and contemporary mystery. Many of her books have placed in contests, including the Daphne du Maurier (romantic suspense) and have been translated into ten languages. She was Notable New Author in 1999. In 2006 she won the Holt Medallion, Best Historical, and in 2012 she won Best Historical in the International Digital Awards and she's had four other titles place in that competition. Her 2011 Christmas novella was named Best Novella in the Romance Through the Ages. She invites readers to www.CherylBolen.com, or her blog, www.cherylsregencyramblings.wordpress.com or Facebook at https://www.facebook.com/pages/Cheryl-Bolen-Books/146842652076424.